Last weekend I had a visit from my friend, mandala artist Steph. It was a really nice time. I missed her, so this was a much overdue visit. When artists get together in a peaceful place to talk and share stories and inspiration, it's an important and powerful thing. I always find these get-togethers to be a great exchange of healing, knowledge, love, support, and inspiration. We sat outside on my patio by the fish pond and talked, and then poked around in my workshop, which is -- as it is for any artist -- one of my most personal spaces. It's a space that is truly me. Right now it's a mess! It's a bit dusty, with my work benches cluttered with little china bowls full of beads and stones and jewelry findings. There are snips of leftover chain from this project or that, pieces of wire twisted and looped into different odd shapes, antique glass buttons, and all types of odds and ends. Much of my tabletop workbench space is amassed with half-finished projects -- brief glimpses of moments of inspiration -- some that get carried on to completion, and others that get set aside in a little china bowl, not put away or out of mind, but just set aside for now. Beneath my work benches I have boxes of surplus china pieces, boxes of sorted vintage flatware; orphaned forks, spoons, and the dinner knives that I use in my jewelry making, as well as shoebox-sized tub after tub of broken china scraps -- leftovers from the jewelry making process -- as I save every single scrap for later use in a mosaic project. I showed Stephanie around my space, asked her to excuse my dust, and then pulled out some random boxes and bowls of odds and ends to show her some of my stash. Dusty old stones? We couldn't keep our hands off of them. Maybe it's something only some can understand, I don't know, but there is a delight, a magic, and an appreciation for the simple earth rock that just brings joy. I showed her this bowl full of stones that I tumbled from rough years and years ago. There were agate and amethyst stones. Around the time I was pre-teen or early teen all I wanted was a rock tumbler. My father (also an artist and understanding "the need") gifted me with one for Christmas one year, along with packages of the different grits and polishes that are used with the tumbler. I was the luckiest girl in the world! These stones were one of my first tumbled projects. I filled the tumbler barrels with the rough rock, along with water and the course grit, which is the first step -- and let it tumble. Once that step was complete, I rinsed the rocks, put them back in the tumbler, added the medium grit and water, and tumbled again - you get the picture - and repeated this process until the rocks were smooth. Then it was time to add a final polish. I didn't. I liked their smooth, frosted surface just the way it was. I didn't need them to be glossy and shiny. I thought they were perfect just the way they were. To me, they were perfect. I offered Stephanie to join me in some impromptu jewelry making so we grabbed some supplies from my studio and headed back outside to work on our creations. Out of everything in my workshop what did she choose to work with? The perfect stones, of course. hehe. 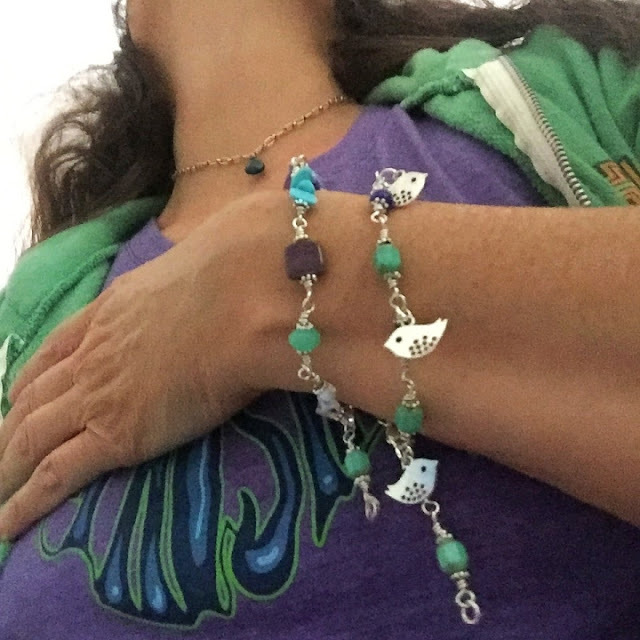 I grabbed the bowl of stones and some other random beads and wire -- Stephanie was in the mood to wrap some stones while I had an urge to make some simple beaded bracelets -- and we did our thing. I love making jewelry outdoors! 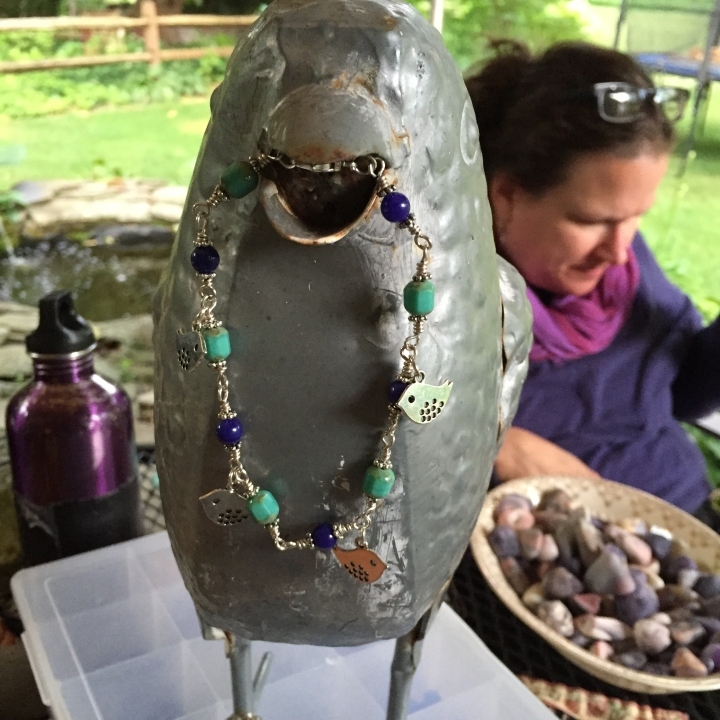 This bird displays the simple wire-wrapped bird bracelet I made while Steph wraps stones in background. Two of the bracelets I made that day...as always, I was talking and not measuring and both turned out too long for my tiny wrists! I might list these for sale in my shop, or turn them into necklaces. I never was one for perfection in myself, that's for sure! My hair usually could use a cut, and something that resembles a style. I don't eat a perfectly healthy diet, and my clothes seem to always be either a little too loose or a little too tight -- but that's alright. I guess it's just the way I am. I choose to wear what clothes I like, no matter if it's in style or not. As long as I'm feelin' it, that's kind of all that matters. As a matter of fact, I'll choose imperfection any day. I would love my sadly broken but still beautiful old china plate join the stash in your studio. Could I send it to you? It's so pretty, I hate to just throw it out. I love those tumbled stones too. I've always been one to pick up stones and look at them. I just might need to buy a tumbler for my next hobby. Hi Barbara, they're lots of fun! They're pretty with their frosty cast. Wouldn't it be wonderful if we ALL could be comfortable in our skin? Every time I see a beautiful old china plate, I think of you. 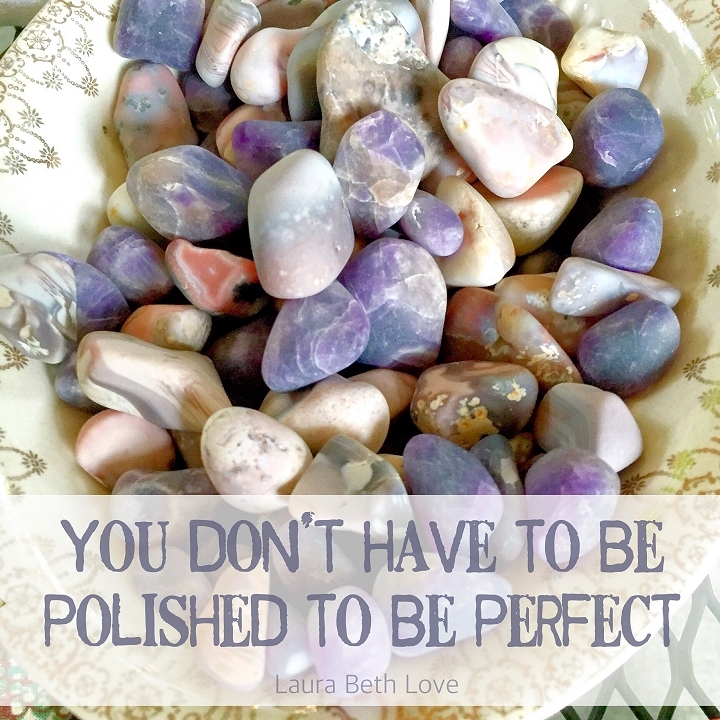 The tumbled stones are beautiful! How wonderful your friend was able to spend some crafty time with you!